Christina Dean is the Founder and CEO of Redress, a Hong Kong-based NGO working to reduce waste in the fashion industry. Tell me about Redress and what led you to start it? I started Redress following a phenomenal life-changing professional and personal experience. I used to be a journalist and when I moved to Hong Kong in 2005, I was working as a freelancer and became increasingly interested in China’s environmental crisis. To me, it was obscene that 16 out of the world’s top 20 most polluted cities were in China, which were essentially on my new doorstep. The more I looked into this, the more compelled I became by how China’s fashion and textile industries were contributing to this environmental crisis, which not only affects the planet but is also killing people. This insight led to a huge professional change – I put down my pen and started the NGO – I had unwittingly unearthed my life’s calling. How much clothing waste are we generating today? No one knows exactly how much clothing and textile waste we produce today globally, but it’s in the magnitude of millions and millions of toxic tonnes. In China, it’s estimated that 26 millions tonnes of industry and consumer textile waste is generated every year. In my home in Hong Kong, we dump 270 tonnes of clothing per day, which, at an estimation, represents around 11,000 garments entering per hour. 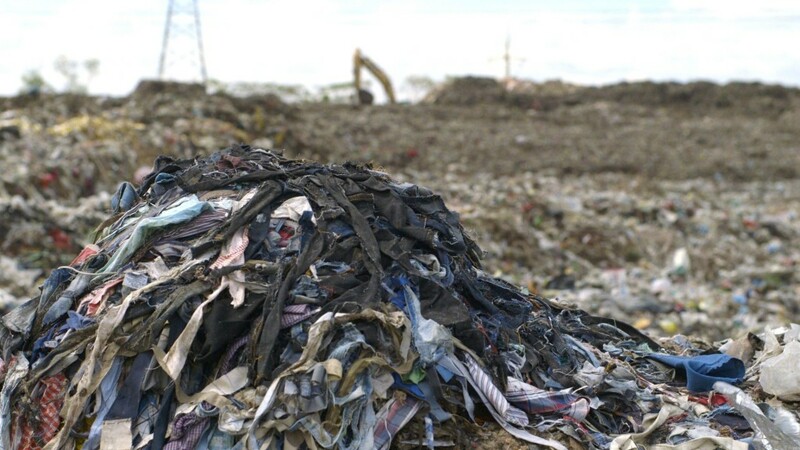 Clothing waste in a landfill from the film. How dangerous is that waste? Textile waste is dangerous for a number of reasons extending from when the textiles are first produced through to their unnecessary and often premature demise in landfill. To put this issue into perspective, one has to consider how environmentally polluting and socially damaging textiles production is. Production requires extensive use of our limited natural resources, such as water, oil and soil. Just one pair of regular jeans requires 3,625 liters of water (the same amount of water one person requires for basic survival for around 2.5 years), 3kg of chemicals (which are highly toxic, carcinogenic and which therefore poison our lands and people), 400MJ of energy (which is like leaving a light bulb on for 116 days) and 13 square meters of harvested land. Collectively, these impacts threaten our environment, contribute to climate change, and threaten people’s ability to survive. With this far reaching devastation in mind, wasting materials is dangerous as it is disastrous. When we waste textiles, by chucking or burning billions of garments every year, we waste all of the valuable resources that are locked in the textiles during their production. Instead of re-capturing the value of the textiles into a new life, from clothes to carpets, all of their resources hit an early grave. Critically, this means we are not slowing down and the toxic production of new textiles continues unabated. This has disastrous knock-on effects; fresh water is running out, chemicals are threatening to throttle the soil and air, non-renewable oil is critically toxic to come by, and land is becoming scarcer as competition for food to feed the world rises. All of this places extreme threat to communities around the world. But still, people think they have nothing to wear! Finally, at a local level, when you dump textiles into a landfill, you add extra space constraints, you add extra damaging materials into the mix, resulting in more toxic runoff. What impact has fast-fashion had on clothing waste? Fast fashion – the mass production of trend-driven clothes under razor thin production timelines and at gutter-low price points – has made clothes more accessible and cheaper to buy for the consumer. Today, buying a dress is like buying a BigMac; cheap, fast and, judging by the poorer quality seen in fast fashion clothes, not very healthy. Consumers are tempted into buying higher quantities of these cheap to purchase and produce clothes, many of which won’t last a few spin cycles in your washing machine, let alone a season. This ultimately perpetuates the cycle and drives up production – some estimates suggest we are producing 150 billion new garments year. And you only have to look into landfills – particularly in the US – to witness the shocking results. The amount of textile waste in U.S. landfills has grown at more than three times the rate of overall waste volumes for all materials. Between 2000 and 2011, textile waste increased 38% whilst the overall material waste declined by 1%. So how do we reverse this trend? The ultimate solution is for consumers to buy less, buy better and care more. By buying less, we will decrease the unnecessary production of new textiles and also reduce our personal clothes waste. Buying better essentially means being more conscious of what we buy, from better quality fabrics made from more sustainable materials, which tends to mean spending more on each garment. Unfortunately, the moment you tell consumers to spend more, they wrongly run a mile, when in fact there are personal benefits to investing in quality clothes. Spending more on an item of clothing won’t necessarily break the bank – instead of buying three cheap T shirts, buy one quality one that will last you longer. Finally, by caring more for our clothes, we can keep them in the fashion loop for longer, and may look better in the process! Fundamentally, this can be done without compromise to style. We don’t often see the effects of pollution or waste in richer, western countries. Is that a reason why we tend to ignore it? It’s certainly easier to ignore a problem if you can’t see it – let alone breathe it. Where I live in Hong Kong, on the doorstep to China’s biggest fashion and textile production region, I’m confronted with the problem almost every day. It’s not uncommon for the air pollution to be so bad that we’re advised to stay in and my children’t aren’t allowed out to play during their school breaks. Western consumers are generally so remote from the production sites – nearly 75% of global clothing exports and 50% of the world’s textile exports are produced in developing countries – that the reality of the environmental impacts are also removed. This compounds the huge disconnect that Western people have around their responsibility for their own consumption and waste in general. On a personal level, buying whatever we want, then tossing it into our own domestic rubbish bins to be picked up from our doors is simple. Very little thought is given to the horrific impacts this is having on the world. How has your work changed the way you buy clothes? The way I dress has changed radically over the last seven years since I established Redress. Before I started Redress, I would have called myself as a typical fashion consumer. I enjoyed fashion, I shopped quite regularly and had quite a large wardrobe to show for it. Now, after seven years of understanding the challenges, both at the industry level and also on a personal level, I have changed completely. I now only wear (and buy) clothes made from re-used or recycled sources. This essentially means that I wear secondhand clothes or clothes made with up-cycled fabrics or recycled fibres. This ensures that in my personal quest to reflect my own style, I am not consuming new fabrics or driving up demand for virgin fabrics. Through your work with young designers, are you seeing a change in mindset around serious issues like waste and sustainability? Yes, absolutely! Over the last seven years, I have seen designers’ lights first switch on and then their fires passionately burn about sustainable design, especially through our programme, The EcoChic Design Award. Designers are creative souls who want to reflect the world in their designs. They value beauty, integrity and inspiration. So, once fashion designers understand the darker side of the conventional fashion industry, many are compelled to create their work using sustainable, and more ethical production methods. How important is the designer in the process of reducing waste? Designers influence an estimated 80-90% of the environmental and economic costs of a product. This means that they can greatly influence the sustainability, durability and environmental impact of a product, which gives designers a unique power to change the industry directly at its source. In the midst of very serious challenges facing us, what are you most excited about as you look ahead? I’m excited that fashion consumers are starting to think, act and take more responsibility for their fashion purchases. I’m excited about consumers falling in love with fashion again; learning to love it, cherish and flaunt real and true fashion. Fashion should be about beauty and about clothing ourselves in our style, aspirations and values. As people wake up to how polluting most of the fashion industry is, I believe that consumers will redress the way they buy, wear and dispose of their clothes.